Man and Nature; or, Physical Geography as Modified by Human Action. New York: Charles Scribner & Co., 1871. George Perkins Marsh was one of the earliest environmental writers to point out that humans had a destructive influence on the environment, particularly the land. Marsh was a man of diverse interests, able to speak 20 languages, and was one of the founders of the Smithsonian Institute. He was also a United States ambassador to Turkey, and later Italy. Man and Nature, inspired by his observations of the Mediterranean region, advocated for better stewardship of the land. 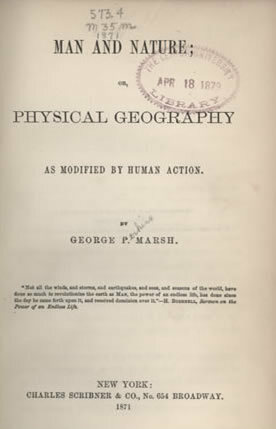 Within a few months of its 1864 publication, Man and Nature would sell over 100,000 copies.